The origins of salt glazing are quite obscure. Commonly it is presumed that the first salted stoneware pots have been made in the Rhineland (Germany) during the late 13th century, or early 14th century. 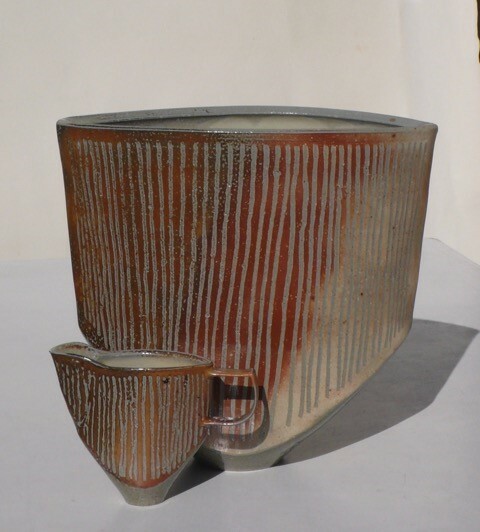 In his book ‘Salt Glazing’ Phil Rogers imagines how a potter could have found out about salt as a glaze. At that time vitreous stoneware already existed in the region of Cologne. Cologne had been an important harbour. Salt was used as a preservative to keep and transport food, such as pork, herring and vegetables in wooden barrels and boxes. It might have happened that a potter simply ran out of wood during the last part of his firing. In desperation he took the leftovers from rotten barrels to finish his firing. When unpacking the kiln this potter might have noticed the thin glaze on his pots and might have had understood that the salted timber could have been the reason.